Make sure to sign up for childcare per the Evite instructions. CECA provides free childcare through GracePoint with timely Evite RSVP! Please note children’s ages in the comment section. 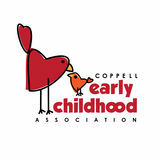 For questions about our monthly Parent Events or speakers, email our CECA Programs Coordinator at programs@coppellearlychildhood.org. Dallas Clinical Psychologist This month’s speaker is Dr. Avery Hoenig, a clinical psychologist who specializes in using Cognitive Behavioral Therapy (CBT) to help children, adolescents, and adults manage mood and anxietyrelated symptoms. CBT is an empirically supported, brief, problem-focused treatment which concentrates on interactions between behavior, thoughts, and emotions. She will be discussing with us different ways to teach your child to have more confidence and the ability to recover from difficult every day situations. Our monthly Parent Events are a great chance to meet other parents and to hear some exceptional speakers talking about hot parenting topics. We serve hot coffee and delicious refreshments, and best of all… there is free childcare! Find out more and RSVP via the Evite! New Entrance for 2018 CECA Parent Event meetings are held at GracePoint Church. We will meet in the Fellowship Hall, which is down the first hall to the right when you walk in the entrance for The Ark. When you come, follow signs to The ARK. Park on the back side of the church by The ARK. You will enter the building through the double doors for The ARK. If doors are locked, please push the button, and an assitant will buzz you into the facility. Once you enter, you will go all the way down to the end of the hall, and on the left-hand side is where you will drop off your kid(s) for childcare. We will meet in the Fellowship Hall near the Ark entrance area. Lost? Confused? Just need a friend? Look for a red CECA shirt or call the phone number listed on the evite! After a hands-on program for the kids at 9am, go discover the great hiking trails around the center. Almost all of the trails can accommodate single all‑terrain type strollers and many a double all‑terrain type stroller. Feel free to pack a lunch and enjoy a picnic on the trail! Evite to follow, but no reservations are required. Alternate plans will be posted on the CECA Facebook page pending inclement weather. Join us for private shopping, light snacks, and wine! $4 off order of $20 or more online only USE CODE: SavE420 Expires in 2 Weeks. Participating locations only; cannot be combined with other offers. Price does not include delivery charge or taxes, (varies by location). Delivery orders must meet minimum amount. USE CODE: HD5498 Expires in 2 Weeks. Participating locations only; cannot be combined with other offers. Price does not include delivery charge or taxes, (varies by location). Delivery orders must meet minimum amount. $15.99 Large 1-Topping Pizza & 10pc Dippers or Wings USE CODE: HD1624 Expires in 2 Weeks. Participating locations only; cannot be combined with other offers. Price does not include delivery charge or taxes, (varies by location). Delivery orders must meet minimum amount. Thanks to Jenny of Jennifer’s Bake Shoppe for teaching us great new cookie decorating skills! General Meeting @ Gracepoint Church Attend the March general meeting to nominate or vote for the 2019-2020 CECA board members. J.J. White Award Nominations Submit your J.J. White Award nomination at the March general meeting to recognize an outstanding CECA member. 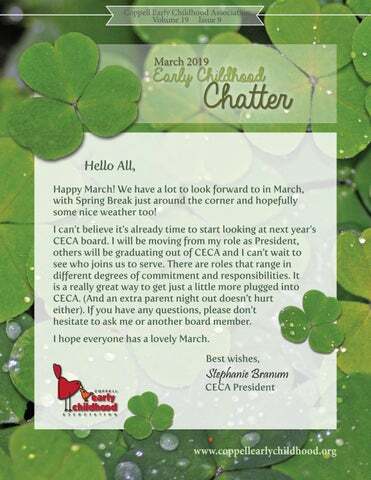 Join the 2019-2020 CECA Board! This is a fun board with jobs of varying degrees of commitment. It is a great way to get involved and meet new people! GracePoint Church, Coppell Don’t forget to RSVP for childcare!